Just saw this online. For those who still don't know Beck Mongolian Chop Squad is having a Live-action movie this 2010. 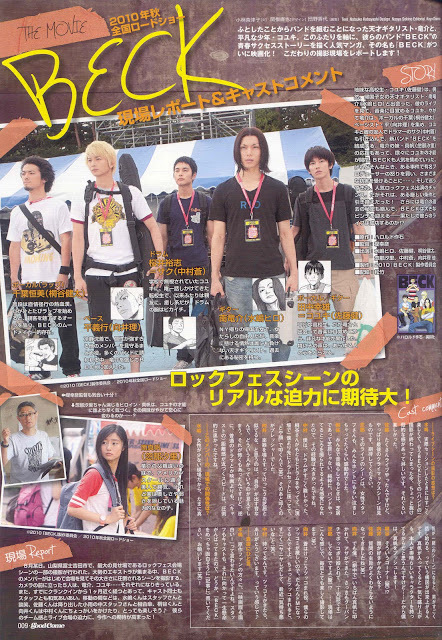 Didn't really watch the Beck anime but I'm just amused that Tendou (Hiro Mizushima) and Ryotaro (Takeru Sato), Kabuto and Den-O Respectively from the Kamen Rider series is included in the cast to play Ryusuke and Koyuki respectively. Watchout for this film this 2010. Update: Here is the latest teaser trailer for the Beck Live-Action. Nothing is really special but few scenes with the main cast. Enjoy.